For the better part of 2 decades, I’ve been volunteering once a year or so for the Calumet Players. Annually, the players put on a couple of shows at the historic Calumet Theater in Calumet, MI. I usually work the musicals, and almost always work in the flyloft. In this theater, the flyloft is located 30′ above the stage floor on a deck that is about 8′ wide and 20′ long. The working part of the loft is the pinrail, where belaying pins sit in holes in long rails, and ropes are wrapped around them. These ropes hold up the pipes from which the set drops hang. 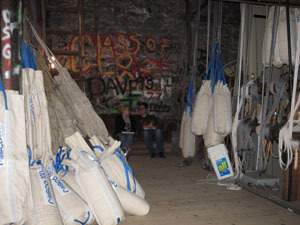 The flyloft crew is responsible for raising and lowering the drops at the cue of the stage manager, and doing it safely. I’ve never been attracted to performing on stage. My enjoyment has always come from supporting the actors from backstage. I like the flyloft because my crew and I have it pretty much to ourselves up there, and can spend down times reading. We can even talk quietly. First of all, thank-you for coming to the theater. Our modern lives give us a lot of opportunities for entertainment, and the fact that you spent an evening and some of your money to attend is flattering to us all. These productions are community theater, which means no one (that I know of) gets paid anything. Just let that sink in for a minute. Particularly the director and cast spend months of evenings and weekends working on these plays. They fit all this rehearsing into their already busy lives. In my experience, very few people are naturally good at this kind of thing. The performance you see on stage is the result of a LOT of hard work. Besides the actors, various people take charge of costumes, the program, the music (both the singers and orchestra) management of the stage, set construction, light design and light booth operation, sound design and operation, and so on. The purpose is to create a world on the little stage that tells you a story, and that removes you briefly from your regular world. The purpose is to give you a perspective on life that might have eluded you until tonight. And perhaps you’ll leave the theater at the end of the performance humming a tune that will stay stuck in your head for a while. Since we are so used to consuming our entertainment via a video screen, some of us are a bit rusty when it comes to interacting with a live performance. The next thing I have to say might surprise you, but I’m firmly convinced it is true. THE MORE YOU ENJOY THE PERFORMANCE, THE BETTER THE PERFORMANCE WILL BE. As I said earlier, I’ve observed a lot of audiences over the years, both from in the audience, and from behind (and above) the stage. Some audiences have more trouble getting going than others. Folks seem shy about being the first one to laugh at a joke, or clap at the end of a song. We are reluctant to look silly in front of our peers, so we often just sit there. Here is my request to you. Be the person that claps first, even if you do it in error. Be the person that laughs out loud at something that is supposed to be funny. I promise you the actor/singer up on stage will hear you. And so will the people around you in the audience. Everyone will relax a little when the desired response is elicited from someone in the audience. And the next joke might just attract some other brave soul to laugh. We all know that laughter is infectious. And the more you respond, the better the actors will feel about their performance, and the better performance you’ll get from them. Guaranteed. We enjoy eating at a restaurant as much as the next guy. Having a list of alternatives presented, choosing the tastiest one, and having someone responsible for cleaning up afterward is a treat like few others. There are some drawbacks, like any decision in life, but when the time comes for us to splurge on a meal out, we let the good times roll. One thing the restaurant experience fails to impart is the pleasure of handling food… especially the smells. An onion we’ve grown ourselves presents such a lovely presence as its texture is explored under the knife, as it’s odor escapes and slices through your nose. I thought about these things this morning when I came downstairs for breakfast. The kitchen smelled really good, and I hadn’t even done any food prep yet. About a week ago, one of our neighbors brought us a couple of baskets of grapes he’d grown on his vines. These were Fredonia grapes, which I’d never heard of. There happened to be just enough to make 2 gallons of wine, so we cleaned them and got them placed in mesh bags and into the primary fermentors. One of the chemicals my recipe book calls for is a Campden Tablet. 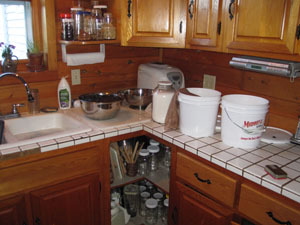 One is crushed per gallon of wine and is added to the primary fermentor with all the other ingredients except the yeast. After 24 hours, the yeast is pitched, and then the waiting begins. If a batch of wine is going to fail, it is at this point. Sometimes the yeast doesn’t take hold. This morning when I came downstairs thinking about other things, the smell of fermenting grapes hit my nostrils. The smell is very nice but hard to describe. And I got to thinking about all the folks out there that enjoy a glass of wine, but miss out on the process of making that wine. The colors, textures, and most of all for me, the smells, are such an important part of the experience. In this case especially, where the grapes came from a good friend and neighbor, the experience is enhanced. If this batch comes out (we’ll know in about 6 months) then our neighbor, who also likes wine, will get a bottle or two, and he’ll be part of the process. Talk about enhancing the flavor… the memories of the process of preparing the grapes, the smell of the first wine gas, the friendship involved in the exchange of the fruit, and the first sip of the finished product; it doesn’t get much better than that. Many years ago, after Alice’s Dad passed away, I inherited several of his tools. This one has been sitting in the screwdriver drawer in my shop for almost 30 years. 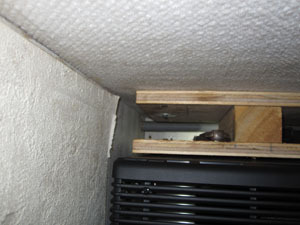 It is designed to allow the manipulation of a screw in very tight corners. I have several cheap versions of this tool that is essentially a bent screwdriver blade, and I’ve used those for various jobs, but never really needed or understood this tool until today. 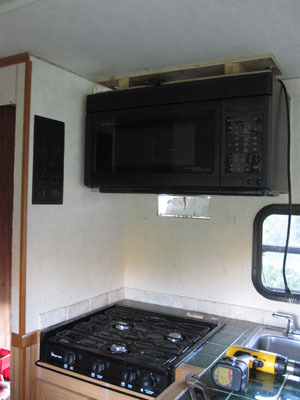 The project I’ve been spending the past 3 days on has been to remove the old microwave and exhaust hood from the motorhome, and replace it all with a convection/microwave. I bought this unit because the bottom of it is an exhaust hood and it even has a little light. It was designed to be installed over a stove. I had barely enough room to get the middle fingers of both hands into the tiny space. I managed to get the screw started several times, but for some reason it wouldn’t go all the way in. I finally took it out, removed the oven one final time, and compared the screw that worked with the one that didn’t. One was 32 threads per inch, and the other was 24. This tiny difference can make installing any screw impossible. Once I got the correct screw, it went in, but it was a struggle, probably because I’d bunged up the threads trying to force the wrong screw in. It took me over 4 hours to get that screw done. 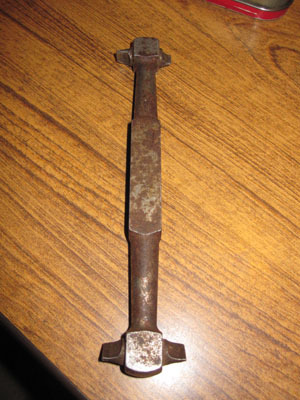 But the small tool in the picture above was what really made it possible. The driver blades are all offset relative to each other, and by finding the slot, giving it a twist, switching to another end, refinding the slot, twisting again, and repeating this 8 times, I was able to move the screw down 1/32″. I had about an inch to go when I started. It took me a long time, but I did finally get this screw in. I told Alice if I ever have to remove this oven, I’m using my acetylene torches! You are currently browsing the Rural Life in the UP of Michigan blog archives for October, 2015.